Recognized colors: Black, blue, broken, castor, chinchilla, chocolate, Himalayan, lilac, opal, otter, red, silver marten, sable point, seal, tortoise, white (ruby-eyed), blue-eyed white. Who doesn’t love the Mini Rex, a 3 ½-pound bunny with a sweet personality and a coat that feels like deep velvet? No wonder the Mini Rex has such a huge following! There were over 2,500 Mini Rex entered in the 2011 ARBA convention, more than any other breed. 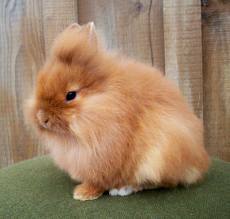 Rex is a distinctive rabbit fur type caused by a recessive gene. 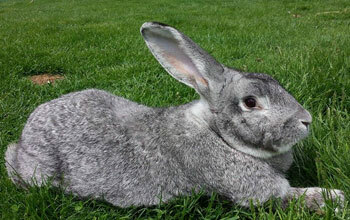 The first Rex rabbits appeared in France around 1920, and the breed was soon spread around the world. The ARBA adopted a standard for the 9-pound Rex (sometimes called the Standard Rex) in 1929. But of course, it didn’t take long for people to want to put that beautiful coat on a smaller bunny. The Europeans got to it first, using Netherland Dwarfs to produce the Dwarf Rex. By 1984, the Dwarf Rex had arrived in America, and a lady named Mona Berryhill won a pair at an auction. She bred the Dwarf Rex buck to a lynx standard Rex doe, and three does from that litter became the foundation for the Mini Rex. The breed was accepted for its final showing at the Madison, Wisconsin, convention in 1988. In terms of popularity, the Mini Rex took off right away and has never looked back. The Mini Rex does carry the dwarfing gene, but its type and appearance is certainly not “extreme dwarf.” This breed is in the compact type group and is posed with the head low on the shoulders. Ideally, the topline rises right behind the ears to form a very round, deep body. The desired coat length is 5/8 inch. Fur shorter than 7/8 inch or longer than 1 ½ inches should be disqualified. Mini Rex fur sticks up nearly perpendicular to the body, and with good density feels plush and incredibly soft to the touch. Long guard hairs, poor density, or narrow tips to the hairs can destroy the proper texture. The Mini Rex standard recognizes well over a dozen colors, with more in development all the time. The most popular colors include black, broken, and castor. The most recently accepted color is Silver Marten, officially added to the standard in February 2012. With any breed that is so widespread, some lines will have better personalities than others. However, Mini Rex in general have friendly temperaments. This breed is an excellent choice for a child starting in rabbits, ranking up there with Himalayan and Dutch.